Editorials from Theslowlane: My wish for Santa. Peaceful bike paths. My wish for Santa. Peaceful bike paths. Tammy Bennett, a fitness instructor at YMCA, dressed up like Santa before Christmas. She was taking wishes. 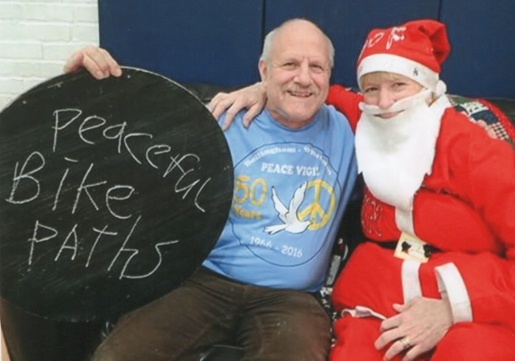 I happened to be wearing a t-shirt commemorating the 50th anniversary of Bellingham Peace Vigil, so I wrote on the Santa wish list chalkboard, "Peaceful Bike Paths."